Annan lifted the points to maintain their push for one of the play off places but the defeat keeps Cowdenbeath firmly rooted at the bottom of the league and now with a real battle on their hands to avoid the bottom slot. It was a match which was decided by 2 glorious shots one which flew into the top corner of the net and the other which struck the crossbar. It was not a classic game of football but a battle with Cowdenbeath fighting for their survival and Annan matching them throughout. The result however was in doubt right until the final whistle. Annan started promisingly and in the opening minutes Annan’s Rabin Omar and Gerald McLauchlan both required treatment for head knocks but the free kick awarded in Annan’s favour was an excellent opportunity but Weathersons free kick never hit the target. A minute later Jean Guy Lucas was booked for what looked like a nasty challenge. 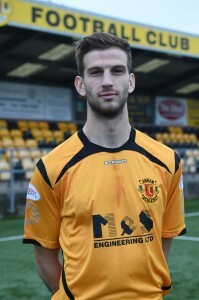 Jean Guy Lucas was at the end of a good Annan move down the right ending with a dangerous cross in the 12th minute which was cleared for a corner kick. Annan squandered an opportunity to take the lead when they were awarded a penalty kick in the 15th minute after Rabin Omar was fouled by McLauchlan but Weatherson uncharacteristically made a mess of the opportunity shooting straight down the middle but the weak effort did not seriously test keeper Jamie Sneddon. Cowdenbeath started enjoying a good period in the match without testing Annan keeper Blair Currie. Kris Renton came closest to breaking the deadlock on the half hour mark when his well struck shot went narrowly past the post. 5 minutes later Nathan Flanagan sent in an inviting cross for Weatherson but once again the strikers attempt let him down with the shot going past the post. Cowdenbeath started the second half with a bang and they won a penalty after Max Wright’s weak challenge on Liam Henderson on the edge of the box caught the attacker but once again the referee was perfectly placed. It was however another poor attempt to score from the spot with Fraser Mullens effort saved by Blair Currie. Swinglehurst then conceded a free kick fouling Carrick on the edge of the box but the effort never got past the Annan wall. Annan were then denied by a fine Jamie Sneddon save in the 53rd minute when Nathan Flanagan and Darren Ramsay burst through the Cowdenbeath defence and Ramsay’s well placed shot was saved by the legs of the keeper. The game was on a knife edge, Shaun Sutherland’s 62nd minute effort went narrowly past the post closely followed by a low Aiden Smith effort from the edge of the box. Liam Henderson was then denied by the cross bar when his 25 yarder looked to be heading for the top corner of the net. It was a fortunate break for Annan and an unfortunate moment in the match for the Fifers. Darren Ramsay’s low well struck shot from a penetrating Flanagan run and lay off tested the keeper. At the other end Dale Carrick’s effort sailed over the bar. The goal which eventually sealed the game in Annan’s favour arrived in the 75th minute, it was created down on the right when Jean Guy Lucas did well to keep the ball in play squaring the ball to Gavin Skelton who threaded the ball into the path of Aiden Smith and the on loan Queens striker finished with a glorious 25 yarder into the top corner of the net to give James Sneddon no chance. Annan had Blair Currie to thank for an excellent save to deny substitute Lewis Moore who collected a through ball finishing with a well struck shot which the keeper parried away. Cowdenbeath pushed forward in the final minutes on the game in an effort to get something out of the match but once gain the Annan defence stood firm to retain a blank sheet. It was a good day for Annan with all the teams above them going down, top of the table Forfar Athletic slipped up going down at home 3-2 at the hands of Berwick Rangers, Arbroath failed to take advantage going down 1-0 at home to Montrose, Edinburgh City defeated Elgin City 3-0 a result which saw Annan leapfrog Elgin into third place. Stirling maintained their push for the play offs with a 3-2 victory over Clyde who now face an important match at Cowdenbeath next Saturday. ANNAN ATHLETIC: Blair Currie, Jean Guy Lucas, Jordan Stewart, Raffi Krissian, Steven Swinglehurst,Gavin Skelton, Max Wright ( Barry Cuddihy 65 min), Darren Ramsay, Peter Weatherson, Rabin Omar (Aiden Smith 25 min), Nathan Flanagan . Subs not used : Alex Mitchell, David McKenna, Callum Home, Smart Osadolor, Tom Fry. COWDENBEATH : Jamie Sneddon, David Syme, Fraser Mullen ( Robbie Buchanan 80 min ), Scott Rumsby, Kyle Miller, Dale Carrick (Gary Glen 75 min), Liam Henderson (Lewis Moore 80 min), Kris Renton, Shaun Sutherland , Gerry McLauchlan, Jamie Piper. Subs not used : David McGurn , Brian Ross, Cameron Muirhead and Craig Johnston. REFEREE: Craig Napier. ASSISTANTS Ralph Gordon and Xander Harrison .